The following article or section is in need of assistance from someone who plays Pikmin 3. 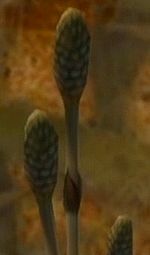 The Horsetail is a plant in Pikmin 2. The plant is brownish and stiffly sticks out of the ground like a post. This hardy plant can survive in soil conditions with few nutrients, but is still very rarely seen, only appearing in the Awakening Wood and underground in the Hole of Beasts. Horsetails, unlike most plants, have retained the primitive method of reproducing via spores. A Horsetail in real life. Artwork of some Pikmin climbing a horsetail. Horsetails also appear in two other Nintendo games: Paper Mario: The Thousand-Year Door and Super Paper Mario, in which they restore 3 HP and 7 HP if eaten, respectively. Artwork of Pikmin climbing a horsetail was released for the first Pikmin game, despite the fact that the plant is not present in the game. This page was last edited on April 3, 2019, at 16:34.